Whilst looking at the course brochure for sixth form, I came across geology. I already loved geography at the time and this seemed like geography but the physical aspects, and about the Earth. This was enough to encourage me to sign up for the course, along with geography, history and law- the latter essentially being fillers to make up the four required subjects. It was in college that geology really grew on me. We learnt geological time, basic mineralogy, basic palaeontology, and I loved it. Before this, I really had no idea what my future held, but now I was certain it was to be geology. Plymouth was my second choice, but as soon as I arrived I decided fate had led me well. I loved Plymouth and the next four years would further reinforce this thought, so that by the end I was glad I hadn’t got the points for my first choice. The course at Plymouth was fantastic and everything that anyone could want from a course; good class sizes, friendly and approachable lecturers, great campus with everything nearby, and best of all, to the envy of my non-geological friends, amazing field trips. In my time at Plymouth, I did fieldwork all over the UK, as well as in Spain, Portugal, Cyprus, Sicily and the USA (Death Valley). During the course we learnt about all the different areas in geology; minerals, fossils, igneous, metamorphic and sedimentary rocks, geohazards, fieldwork techniques, relevant computer programs such as GIS and teamwork. Towards the end of the course personal development became a focus. We worked on the necessary skills for CVs, job interviews, time organisation and other aspects of working life. No doubt without this course, I would not have a job in geology. 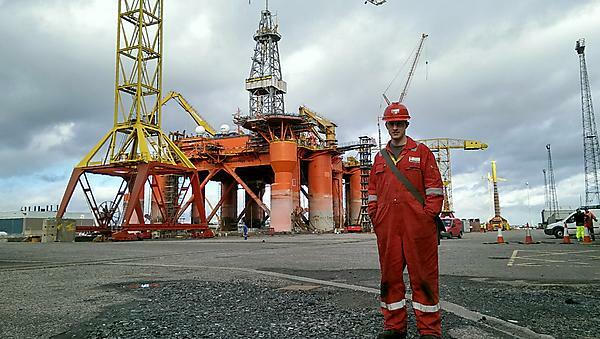 I’m currently on nightshift as a Logging Geologist in the North Sea. This entails sampling and analysing rock chippings as we drill, and the monitoring of various parameters. From this role, I plan to progress and gain experience within the industry. I have been aboard the new 2011 Rowan Norway rig for a week, and will be for a further two weeks. We generally work three weeks on, three weeks off, so time off is plentiful. I still live in Plymouth, and when I’m required to work, they fly me up to Aberdeen and out to sea on a helicopter. I see the job as a step on the ladder, and the first step was choosing geology and Plymouth University.